The Gambler was Kenny Rogers’ third album of 1978, after Love or Something Like It and Every Time Two Fools Collide, a duet album with Dottie West. Thanks to its career-defining title track, The Gambler was also Kenny’s best-selling studio album, with more than five million copies sold in the US. Written by Don Schlitz, “The Gambler” was a story song, the type at which Rogers excelled. It tells the tale the down-on-his-luck narrator who receives some unsolicited advice from a professional gambler during a late-night chance meeting on a “train bound for nowhere”. It was a monster hit, reaching #1 on the country chart, #3 on the adult contemporary chart and #16 on the Hot 100, and is Rogers’ best-remembered song today. Surprisingly, he wasn’t the first to record it. Bobby Bare and Johnny Cash had both released it as an album cut and Schlitz recorded his own version, which maxed out at #65. The album’s other hit single was the ballad “She Believes in Me”, a lush ballad about a struggling musician and the supportive wife he repeatedly takes for granted. It’s a bit too AC-leaning for a lot of people, but it’s a song I’ve always liked a lot. It reached #1 on the country and AC charts, and reached #5 on the Hot 100. “I Wish That I Could Hurt That Way Again” is another nice ballad, written by Rafe Van Hoy, Don Cook and Curly Putman, that would go on to be a big hit for T. Graham Brown in 1986. I think Kenny’s version could have been a big hit, but perhaps United Artists didn’t want to release another ballad on the heels of “She Believes In Me”. Sonny Throckmorton’s “A Little More Like Me (The Crucifixion)”, about a charismatic celebrity — a thinly veiled metaphor for Christ — is another track I really enjoyed. In the 1970s, country artists with crossover potential rarely released albums that were country through and through, preferring instead to include a variety of styles in order to appeal to as wide an audience as possible (although more often than not they managed to please no one). Kenny Rogers was no exception. I expected The Gambler to be a more country-leaning album, but a number of tracks: “Makin’ Music for Money”, “The Hoodooin’ of Miss Fannie DeBerry” (both written by Alex Harvey) and “Tennessee Bottle” incorporate a bluesy, funky vibe that might have been considered cutting edge in the late 70s, but it hasn’t aged at all well. I didn’t like any of these songs. Add to that list Rogers’ original composition “Morgana Jones”, a hot mess of a song that features some jazz scatting along with the R&B and funk. Overall, The Gambler is a mixed bag. Only the two hit singles are essential listening. The album can be streamed, and it may be worth picking up a cheap copy if you can find it, but I recommend cherry-picking the handful of decent songs and forgetting about the rest. 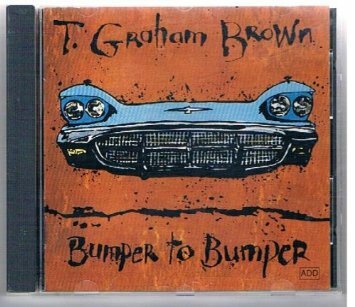 Following 2003’s The Next Right Thing, T. Graham Brown released a second independent album entitled The Present. The sixteen-song set was mostly a collection of cover tunes, some even spiritual in nature. The title track was the project’s only single. It’s a predictable lyric about living life for today that comes off a bit preachy. There is some audible steel framing the chorus, which is nice to hear, although it is pretty faint. The cover tunes are the bread and butter of the project. The Byrds’ “Turn! Turn! Turn! (To Everything There is a Season)” is given a note-for-note reading faithful to the original while his version of Johnny Nash’s “I Can See Clearly Now” has somewhat of a Caribbean feel. “You’ve Got A Friend” is treated to a John Mayer-style bluesy arrangement that showcases Brown’s gospel tendencies. “Bridge Over Troubled Water” is faithful, too, and even adds a gospel choir to drive the message home. Brown has a lot in common sonically with Huey Lewis, so it’s appropriate that he’d cover a Lewis’ tune. “Whole Lotta Lovin’” is treated in Brown’s signature style and he does a great job firmly within his comfort zone. “You Are The Sunshine of My Life” differs very little from the original yet Brown gives a spirited performance opposed to just phoning it in. “Put A Little Love In Your Heart” fits in lyrically with the rest of the album, but comes off very Vegas and Branson-esque, which is far from a compliment. “Just A Closer Walk With Thee” is a bit cheesy despite flourishes of organ throughout. The Present, as a whole, isn’t a terribly enjoyable album and feels like a random covers project and not a cohesive set. Brown does sound comfortable with the material but there’s a feeling of – why? – hanging over the whole album. Once an artist goes independent it’s hard to find even respectable material, so I fully understand why he’d go this route, but that isn’t an excuse for turning in pointless covers that add nothing to any of the songs. 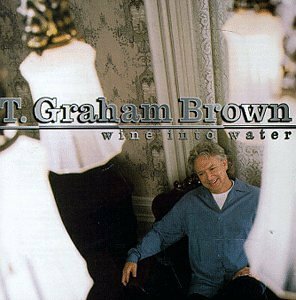 You Can’t Take It With You, released in 1991, marked T. Graham Brown’s final album for Capitol Nashville. While the album came on the heels of his top ten duet with Tanya Tucker, “Don’t Go Out,” it failed to produce any notable singles and was the first CD of his career not to chart. Two singles were released from the project. “With This Ring,” a piano and horn mid-tempo number peaked at #31 while the title track, a ballad, failed to chart. Both singles displayed welcomed restraint in their respective styles and were excellent showcases for Brown vocally. The remainder of You Can’t Take It With You is nicely balanced between uptempo tunes and delicately produced ballads. “Love At Work” is an excellently slinky horn drenched number while “Just A Woman” turns up the piano and drums for a rocking good time that foreshadows what was to come later in the decade. The electric guitar work on “Shaky Ground,” a wail of a rocker, lays the groundwork for songs like Tim McGraw’s “Real Good Man,” a pretty awful tune. Brown’s recording isn’t that bad as the production is nicely contained and doesn’t overshadow the track overall. “Bolt Out of the Blue” wouldn’t have been out of place on a Brooks & Dunn record and is actually quite listenable despite being a bit generic. “The Rock” is a pretty good ballad but suffers from production that’s too bland and a vocal from Brown that lacks the subtly and tenderness needed to pull the song off. “Sweet Believer” has a better balance between vocal and production, but the horns and faux R&B stylings are cheesy. “You’re Everything She Couldn’t Be” follows the same pattern and in this mix is just more of the same. “Pillow of Mercy” is actually very good although it probably would’ve been more interesting if someone like Lee Roy Parnell had sang it instead. After the horrible mess that was Brilliant Conversationalist, I was very pleasantly surprised when I actually enjoyed You Can’t Take It With You a lot. It doesn’t reinvent the wheel by any means, but it shows Brown as an artist trying to pull of substance through quality songs with good production. The bland ballads could’ve used a nice dose of fiddle to make them stand out more and the rockers aren’t Vegas-y at all. This isn’t an outstanding or even a great album, but as far as Brown is concerned, it’s a huge achievement.